The gorgeous and milky beauty Tamannaah Bhatia is an Indian film actress and model, known for her works in films like Ayan (2009), Paiyaa (2010), Veeram (2014), Dharma Durai (2016), Devi (2016), 100% Love (2011) , Bengal Tiger (2015), and Baahubali film series. She has mostly appeared in Tamil and Telugu movies. She started her acting career at the age of 15 and became the first Indian actress to receive a nomination for Best Supporting Actress at Saturn Awards for her work in the movie, Baahubali: The Beginning. In 2017, she was awarded the “Dayawati Modi” Award, one of the highest awards in India conferred for achievements in the field of Art, Culture, and Education. The Baahubali has also received various honours, including Kalaimamani Award, and a Honorary Doctorate from CIAC. Tamannaah was born on December 21, 1989, in Mumbai, Maharashtra, India. She is currently 29 years old. She is the youngest child and the only daughter to parents Santhosh and Rajani Bhatia. His father is a diamond merchant. 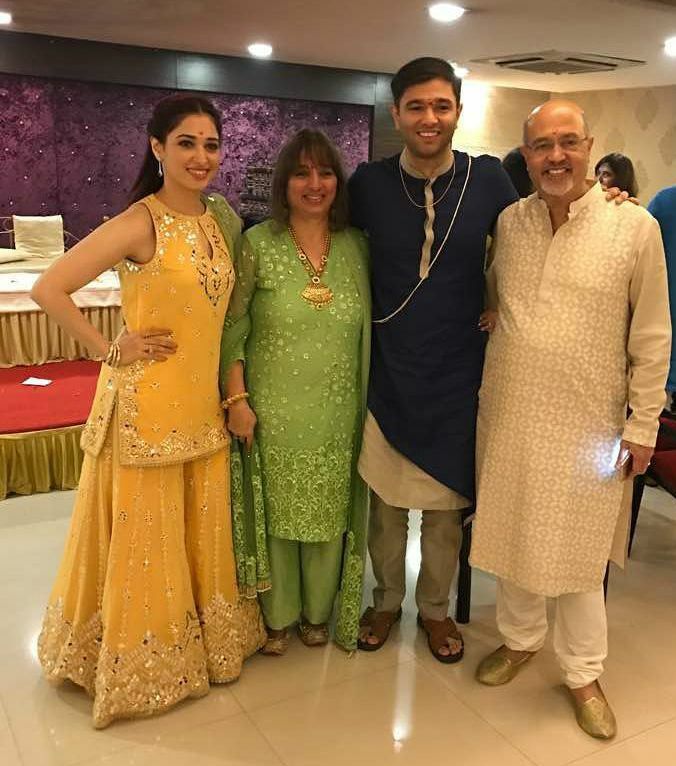 She has an older brother named Anand Bhatia. Tamannaah attended Maneckji Cooper Education Trust School in Mumbai. She earned a Bachelor’s of Arts degree from National College in Mumbai. She also received a Honorary Doctorate from CIAC, in association with KEISIE International University, South Korea for her contributions to Indian cinema. Tamannaah Bhatia was romantically linked with up Indian cricketer Virat Kohli and Actor Sajid Khan in the past. Tamanna and Kohli during an ad shoot and something caught up with each other. They dated for a while before they split. Tamannaah made her onscreen debut as a lead actress at the age of 15 in the 2005 Hindi film, Chand Sa Roshan Chehra. The same year, she made her Telugu film debut with Sri, and the following year her Tamil debut came with Kedi. In 2013, she made her first appearance on television with a cameo in an episode of the Hindi opera, Sapne Suhane Ladakpan Ke. 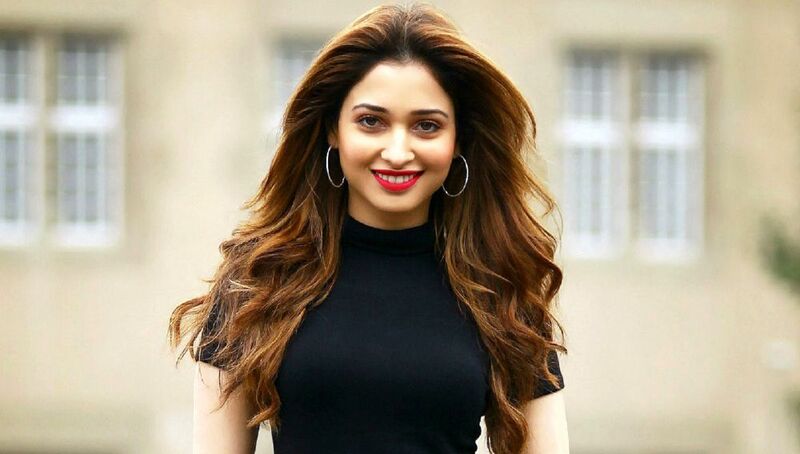 Tamannaah Bhatia earned immense popularity for her portrayal of Avanthika in the Indian epic fantasy films, Baahubali: The Beginning and Baahubali: The Conclusion. She met with rave reviews for her performance in the film and she apparently won many awards. Her notable works include Ayan (2009), Paiyaa (2010), Siruthai (2011), Veeram (2014), Dharma Durai (2016), Devi (2016), Sketch (2018), 100% Love (2011), include Racha (2012), Thadaka (2013), Baahubali: The Beginning (2015), Bengal Tiger (2015), Oopiri (2016) , Baahubali 2: The Conclusion (2017) and F2 – Fun and Frustration (2019). The Milky beauty Tamannaah has appeared in a number of television commercials and print ads for bands such as Shakthi Masala, Power Soap and Sun Direct. She has been the face of renowned brands like Celkon Mobiles, Fanta, Chandrika Ayurvedic Soap, AVR Jewellery, Khazana Jewellery and Zee Telugu, to name a few. In March 2015, she was made the Brand Ambassador for Channel Zee Telugu. She is also the face of Salem based jewelry shop AVR and Khazana Jewellery. Tamannaah Bhatia has a net worth of $12 million US dollars as of 2017. She makes around Rs 2 crore and upwards per film, swelling her wealth. Bhatia’s main source of income comes from acting, brand endorsements, commercials, product launches, and events. Her jewellery line also contributes great share to her fortune. The budding actress Tammy owns a Audi SUV worth Rs 1 – 1.5 crore. She lives in a luxury pod near Juhu in Mumbai along with her family. Tamannaah has her won Jewellery line called Wite-n-Gold, having malls at Bengaluru and Mumbai. Her original name is Tamanna Bhatia, but later she changed it to Tamannaah Bhatia for numerological reasons. Tamannaah Bhatia ventured into acting at the age of 15, after she was spotted by a film enthusiast at her school annual day. She took up acting seriously and studied drama arts at Prithivi Theatre in Mumbai for one year. Tamannaah is the first actress from India who was nominated for Best Supporting Actress at Saturn Awards. She also bagged “Dayawati Modi” Award (among the highest awards in India in the field of Art, Culture, and Education) in 2017 and Kalaimamani Awards from Honourable Chief Minister of Tamil Nadu. Most people think that Tamannaah switched from south Indian film industry to Bollywood. But the fact is that she started the other way round, starring in the Hindi film Chand Sa Roshan Cheh, which went unnoticed. When it comes to dressing up, Tamannaah just need about 15 minutes to turn herself from a girl-next-door to a glamorous diva. Dancing is Tammy’s favourite hobby, so is internet surfing and reading books. She is one of the leading actresses in South Indian film industry, however, she couldn’t able to earn a name for herself in Bollywood. As far as South India is concerned, she is the most bankable actress in business and hence, SS Rajamouli opted her in for his prestigious Baahubali franchise. Tamannaah can speak fluently in Hindi, English, Tamil and Telugu. She launched her own jewelry line called Wite-n-Gold in March 2015, which has its outlets in malls across Mumbai and Bangalore.